There’s a pretty terrace for having breakfast and catching the morning sun.
" I want to say that we have been to France many times over the last ten years, and your home was the best place (and location) that we have been to. Everything was as promised and much more. Everything was wonderful and would highly recommend your home and the support that was provided. " 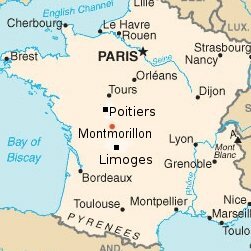 The house is about an hour’s drive from both Poitiers and Limoges. Find out how to get there.